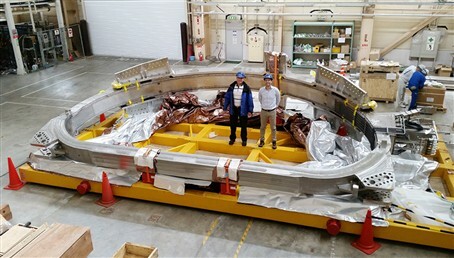 The first Toroidal Field (TF) coil has arrived from Europe to the JT-60SA site in Naka, Japan, where its assembly will soon begin. 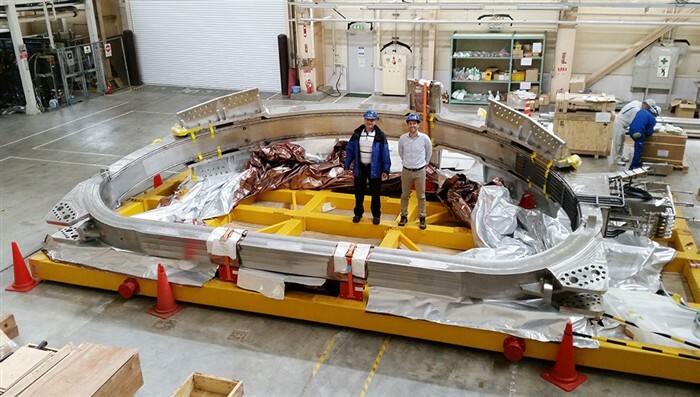 After the coil’s successful fabrication and testing, even its transportation has been somewhat of an achievement, in consideration of the component size: second only to those currently being fabricated for ITER, they are 8 metres high, 5 metres wide, and 33 tonnes heavy. The TF Coils are the backbone of the JT-60SA machine, one of the three projects covered in the Broader Approach Agreement between Europe and Japan. They are large "D" shaped superconducting magnets whose main task will be to create the main magnetic field needed to confine the plasma. In total, an additional 19 voyages are planned to carry the remaining TF coils for the tokamak and their two spares to Japan.